Welcome back to the second part of my Christmas Home Tour! If you missed part 1 you can take a look here. 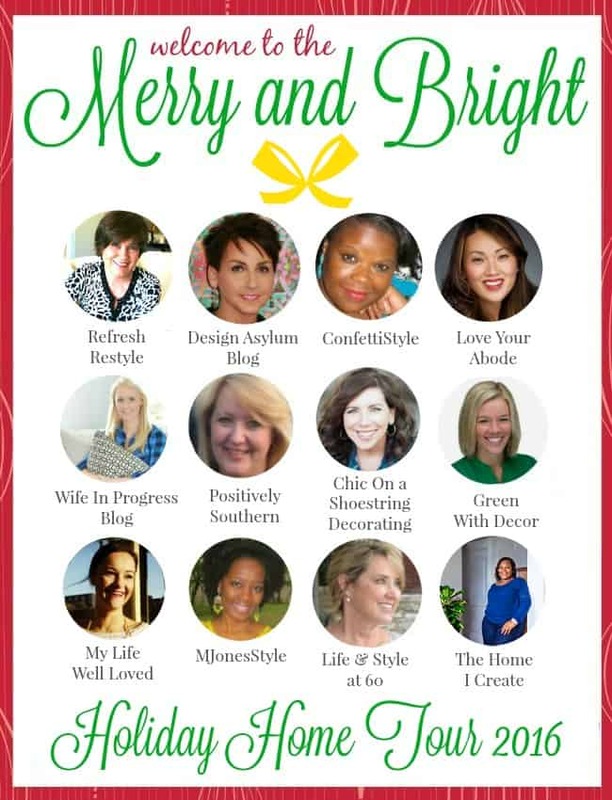 To those of you joining me from Kellie’s gorgeous, fun holiday home tour over at Design Asylum, welcome! If you’re a regular, I’m so glad you’re here. At the bottom of the post, I’ll be sending you along to the next stop of the tour. Apart from putting in all new steps and a new walkway during the summer, the front of our house hasn’t received much love since we moved in. To add a little festive touch, I did hang some wreaths on the windows and we’re hoping to get some lights up over the weekend. Simple but fitting for our colonial I think. This is the third tree I’ve decorated so far this season (including the pink one that had to been taken down). This one is set up in the basement and unlike to snowy whites and bright reds upstairs, I’ve stuck to gold and silver to complement the existing decor in this space. You really don’t need to spend a lot of money to get that wonderful festive glow. By simply adding lights to a hurricane vase you get a beautiful effect. I’m going to have to share the recipe for these cookies next week. They are pretty much brownies in cookie form. Ridiculously delicious. And all have been devoured, needless to say. This Christmas tree is from Tree Classics. It’s one of their “realistic” trees and it’s quite full. The ceilings are pretty low in the basement so this is a 6.5 ft tree. I definitely prefer my King of Christmas flocked tree upstairs but this one is good, too! The tree is decorated with a mixture of ornaments from Michael’s and The Dollar Store plus ribbon from Michael’s, too. I scored everything during a 70% off sale. The floral section is my favorite section to shop for flowers and picks for my tree. Pick whatever tickles your fancy! I particularly love the roses and berries. Think outside the box – you don’t have to stick with “traditional” colors – get out of your comfort zone with jewel tones, pinks and even black! The Sugar Paper gift wrapping under the tree might be my favorite part. I love all the white and gold! Little touches like the personalized gift toppers really add that special touch. The boxes are so pretty that I think they will end up in my bedroom after Christmas! The mantel is simply decorated with some fresh pine greens, small LED lights from Pier 1 and a variety of Christmas trees from Target and Michael’s. I picked up the silver stockings on clearance at Pier 1 three years ago for only $3 a piece. My little Snowy Christmas trees that I made last weekend have found a home down here. Don’t they look cute? I believe that star was a Home Goods find in case you’re in the market for one! The boxwood wreath was sponsored by Silk Plants Direct for the purpose of this box. I simply wrapped it in some decorative ribbon to add a Christmas touch to it. I’m excited to have this boxwood wreath as a new addition to my decor for the rest of the year. I love the pop of freshness it adds above the mantel! I just corralled a few items on the coffee table and added a snow globe, another Christmas tree and some glittery ornaments. I found those glasses at the dollar spot at Target around Thanksgiving but they have similar wine glasses right now. How adorable is this plate? Get one if you can! It’s perfect for hosting this holiday season. I can’t find them online anymore but I’ve seen them as recently as a few days ago at my local Target store. That’s it! I know I had mentioned that I would share my dining room but I never got around to finishing it. I’ve a few other things to share in part 3 of the home tour next week, so fingers crossed I’ll have gotten my act together by then! Beautiful! Thanks for sharing at the Inspiration Spotlight party. Shared. Happy Holidays! Beautiful tree and decor! I love all the different looks. Thanks for sharing at Dishing It & Digging It! I’m loving the Silver and Gold theme – so stylish. Thanks for sharing with us at Over the Moon link up. Love the subtle blue touches on your tree and in this room! Your house looks so pretty!! I love all the green and white. I’m going to have to head to Target to see if I can find that cute plate! Jenna!!! I looove this tree and the matching decor! All the golds and pretty metallics are just stunning! Lovely work and your photography is amazing, you need to teach me your ways LOL. I will definitely shoot you an email, because your pictures are just gorgeous! Jenna, I adore your Christmas tree! That ribbon is so pretty and I love the mix of ornaments you used on the tree. You’ve really created a beautiful holiday home. Jenna, this tree is magnificent! Roses and all! You have inspired me to live a little! Your Christmas tree is beyond belief! It is absolutely gorgeous!!! I love every single thing you have done in your home. It is filled with so much inspiration!! !